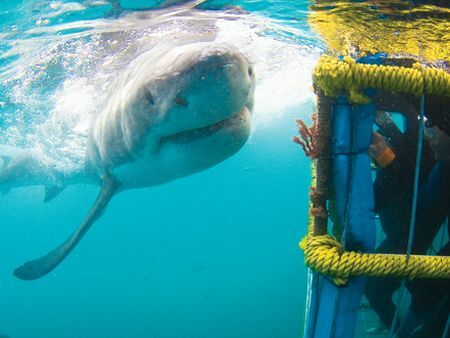 Come face to face with a Great White Shark in the infamous "Shark Alley", near the fishing village of Gansbaai, about 2 hours out of Cape Town. 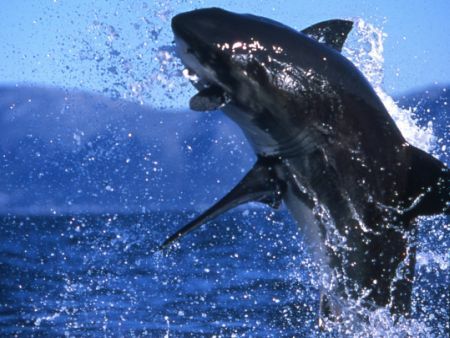 A personal eye-to-eye encounter with this awesome animal is guaranteed to get the adrenaline pumping, and will truly be one of the most breath-taking experiences you will ever live to remember. Your excursion to Geyser and Dyer islands begins at Gansbaai’s picturesque Kleinbaai Harbour which is about a two hour scenic drive from Cape Town and about a forty-five minutes drive from Hermanus. All dive equipment, towels and snacks are stocked, safety equipment is checked and the boat is fuelled prior to the passengers' arrival.. The expected arrival times are usually 07h00 or 08h00 and possibly 10h30 or 11:30am, should we have a second trip on the day. The excursion takes approximately 4 - 4½ hours, starting normally with a light welcome pre trip meal and the briefing before boarding the boat. 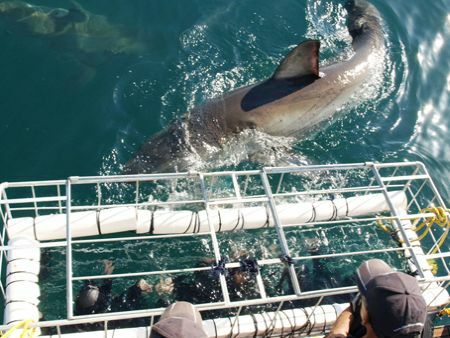 We then enjoy a 15-20 minute boat drive to the dive site for about 2½ - 3 hours at sea, shark cage diving and enjoying the close sightings of the Great White Sharks. While not in the cage, refreshments are enjoyed while on the viewing deck. 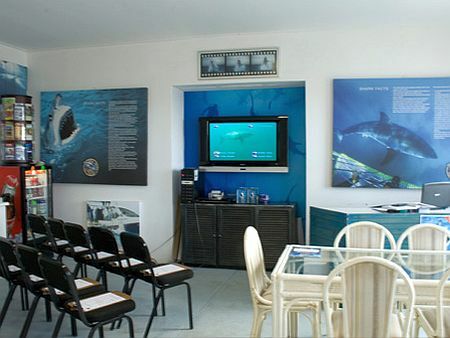 The excursion ends with post trip refreshments and viewing of the DVD of the day's trip, with an option to buy the DVD at ZAR 350.00 per DVD. 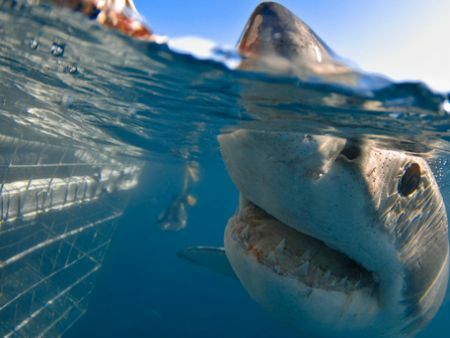 You may do multiple dives in our cage dependent on shark activity and the weather- and sea conditions. 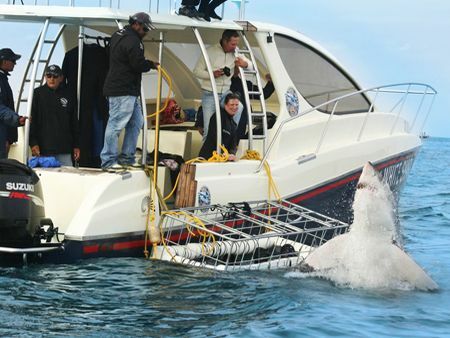 White Shark is a 12 meter long sea-cabin cruiser Cat. 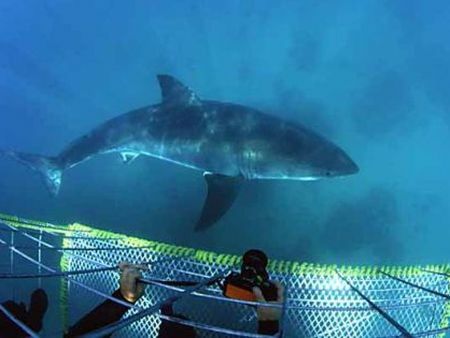 It has been custom built to the specifications required in the shark cage diving industry. 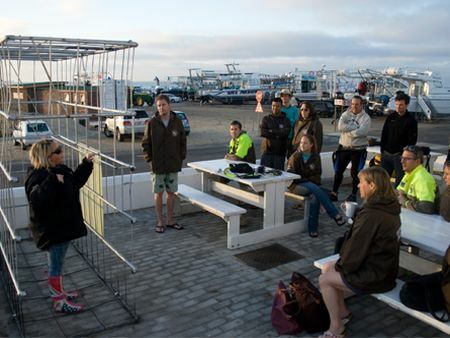 She is the most recent boat built in the shark cage diving industry with the most modern design and requirements installed. Return transfers Cape Town or close surroundings R450 per person. Return transfers from Hermanus R 350 per person. Self -drive or Transport options.